Ahhh, I see. My bad, Hermano. Salud. The nodes are due to my lighting. Use COBs and you will have the same result. Just saying. I love COBs. Might include a QB soon. What’re the genetics of the Purple Mexican? 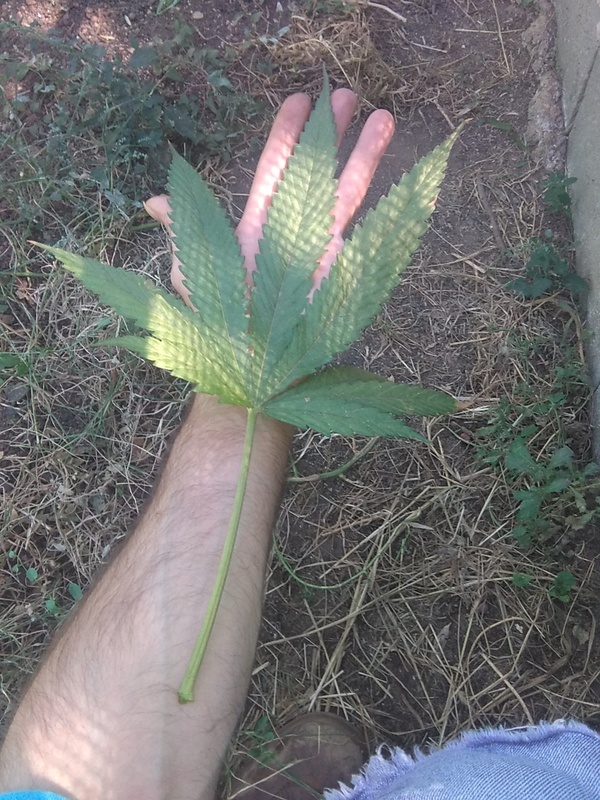 It looks pretty cool, but I think my leaves are even thinner and more spaced out than that. If my plant were the Barney’s cross, it would still be 90/10. My question is, how did they end up with such strong Sativa dominance? They clearly didn’t use any Kushes or strong indicas. Either that, or they repeatedly backcrossed it. Your Purple Mexican vs my AG. Your PM is Oaxaca x Chitral Kush. You can clearly see the Indica influence in yours, whereas if it is at all in mine, it is at least more Sativa than that PM cross. 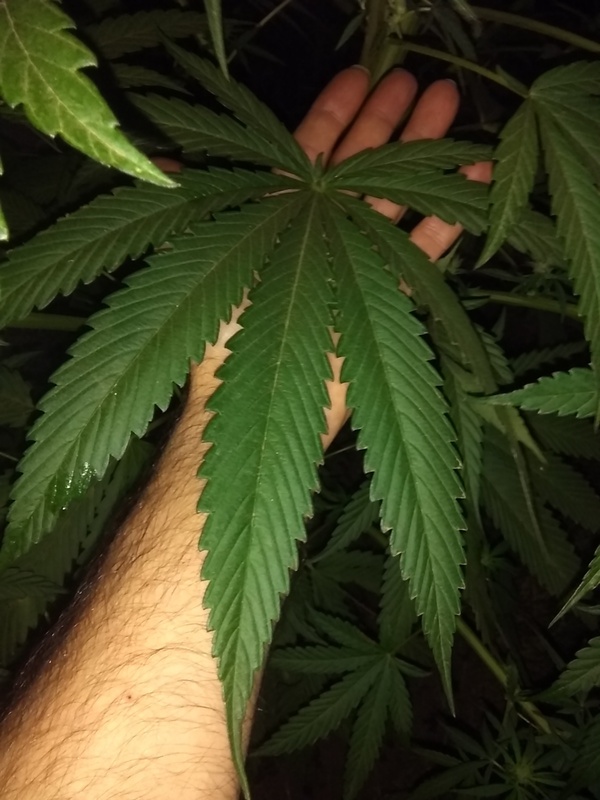 You can see my leaves are smaller, thinner, and with more spacing. I’d probably say that, if it is a hybrid, it’s still highly Sativa dominant. Exactly. Which was my point. Yours is a cross. And, they’re mature enough. Me touching them won’t hurt them. Rain and bugs and animals touch them all the time in nature. Wind touches them. I’m not going to hurt it by touching it. C’mon, you act like people don’t top or supercrop new growth all the time. That’s not even new. Plants grow in dirtier environments than what my hands can present. What he's saying is that you're comparing your hand to a new-growth leaf, rather than a mature leaf. Nothing about cleanliness. Some is lost in translation, as the native tongue for MiG is Spanish. Many of us consider him to be our resident sativa expert. Look at the pics I just posted. They’re all like that. There are no Indican leaves on that entire plant. It’s pretty clearly Sativa. Look at the structure, for Christ’s sake. 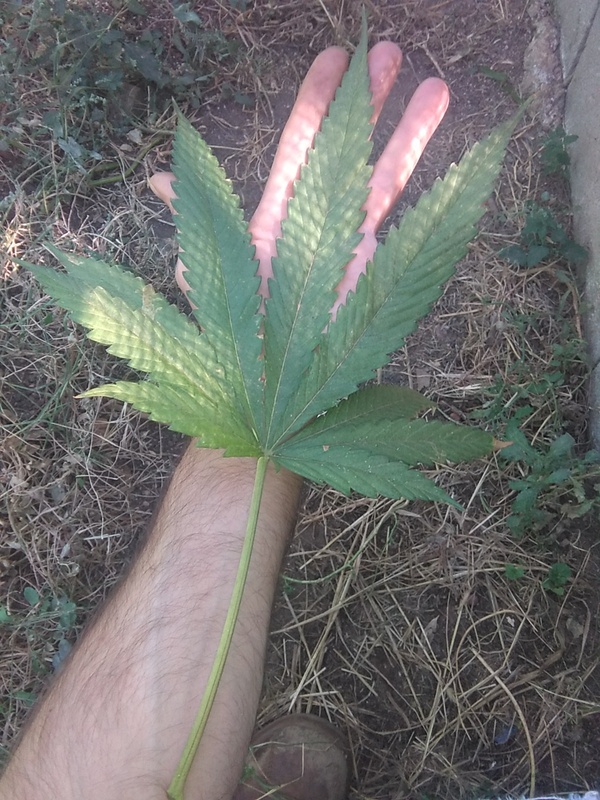 Here are some pics of my hand next to the lowest, older leaves. I really don’t know how any of you guys could even believe it’s any kind of hybrid. Look at the structure, for Christ’s sake. I wasn't arguing for or against. Just noting the language difference. That's a pretty short internode length for a sativa at 3.5 weeks flower. Must be a keeper. Like I keep telling everyone, it’s photoinhibition. I just raised my lights. It’s clearly even flowering slowly. And it’s 2 weeks, 3 days in flower, not 3. I wasn’t arguing, it was just a figure of speech. 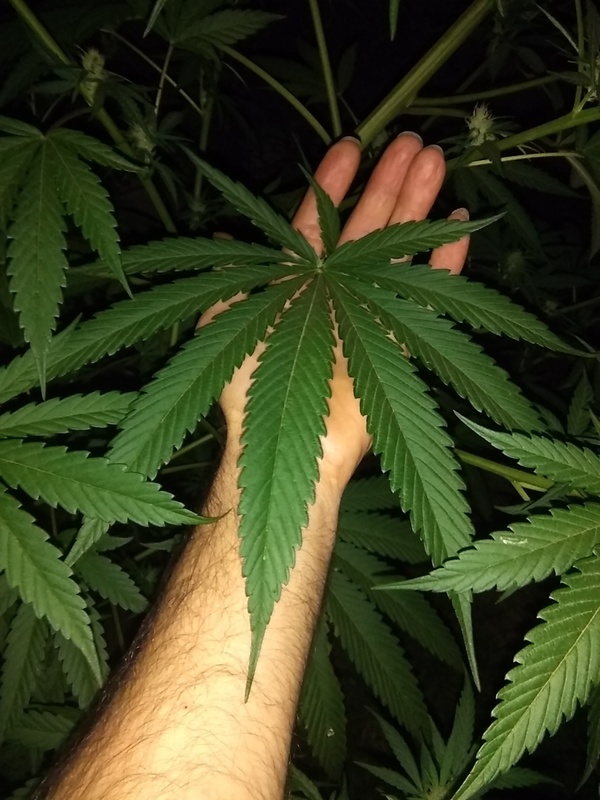 Further showing the Sativa-structured profile, clearly Sativa leaves (whether or not they are pencil thin.) I really don’t understand what the issue is. What do you think of her, @MiG? @Viva_Mexico? And as the leaves grow more fingers, the fingers are getting slimmer. Like, pencil thin. I am up to 13 fingers on the very top one, 11 on the one below that. You’re all completely nuts, I swear. This is definitely a Sativa. Man, those are two great starters, the shoreline is a dutch born sensi sk, raised in Texas and the AG is also a Texas staple, its an ibl mexi.. Great looking plants! Great setup too! Really, if u want to make an IBL, just stablize yur AG/Shore.. once u breed it as f1, if u were to outcross it again, it will be harder to stablize the resulting poly. and it will be super hard, bc you want to cross yur f1 to another f1 poly of an f1 poly... if u want to outcross yur new AG/Shore F1, then choose something that is stable (properly bred by a real breeder) or choose another landrace. I have a Bx1 I’m crossing the Bx3 to as well. I plan to stabilize the AG x Shoreline into its own stable line before experimenting with the extra step.